Damn it. I’ve been expelled from PZ Myers blog Pharyngula. 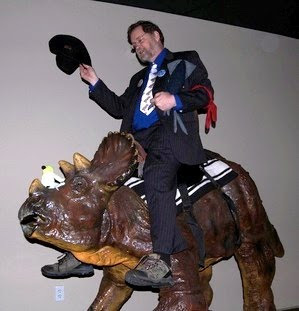 PZ has rules about what is allowed on his blog which creationists must follow. If you cross the line you get put in the dungeon and that means you can no longer contribute comments. I admit that I played around as close to the line as possible without crossing over -- and sometimes did stick my pinky toe over just to annoy PZ. A few times he accused me of being inane. I didn’t know what that word meant so I went to Wikipedia to look it up an all I found was this picture. Anyway, the last time I stuck my pinky over the line is when I joked that PZ was preparing a rebuttal to a simulation program I wrote called Genomicron. That’s when I was expelled. I don't know if PZ really knew that I was joking or if he doesn't understand my sense of humor and really thought I was lying. If any Pharyngulites read this blog post send PZ this message. It was a joke PZ. Please let me back on your blog. I promise to be good (fingers crossed behind my back). The Silverlight application below simulates mutation and natural selection of genomes. You can start the simulation now by pressing the Evolve Genome button and then read on. Note that there are two views to this application: the Simulation View and the Mutation View. The Mutation View shows what happens when a coding sequence is mutated. Press the Mutation View tab and go look. The simulation will keep running while you are in the Mutation View. While in the Mutation View press the Initialize button to get a starting coding sequence. The press the Mutate button repeatedly to see what happens to a coding sequence when random mutations are applied. Note that this application allows the user to configure the type of mutations and length of mutation as well as the percentage of the genome that gets mutated. The length of the mutations is given by length = Max - (Max-Median)*log2(random+1)/31. This formula favors shorter mutations but allows very long ones to happen. Random is a random number between 0 and 4,294,967,295. The value of length return is rounded to the nearest integer except that all length values less 1.5 are rounded to 1. This allows for a median unrounded mutation length that is a positive number less than 1 and will affect the percentage of single point mutations. 10 child genomes are created using random mutation on a parent genome. The child genome with the largest average size coding sequence is selected to be the parent of the next generation. The goal of this simulation is to see if it is possible to create a genome with coding sequences comparible to the average length of human coding sequences by selecting the genome with the largest average length coding sequence. Human genes are known to be about 1000 codons long on the average. Click here to download the source code. The program is a Silverlight application written in C# using Visual Studio 2008.